Getting ready for our eBooks for Everyone Else conferences, I discovered an author named Bob Mayer who impressed me with his self-publishing zeal and apparent success. Bob has written lots of military fiction, science fiction, even a romance novel, and some non-fiction: dozens of books over the years for major publishers. Most of it was mass-market, most of it reverted relatively easily and Bob systematically secured those rights reversions for years. He caught my attention with the bare bones of his story. He started putting his work up as ebooks in January, when he sold a few hundred books. By July he had more than 40 titles available and was selling a total of over 100,000 units a month. I had long wanted to put an author before my conference audiences who had achieved self-publishing success to talk about how s/he’d done it. Joe Konrath and, more recently, John Locke had politely turned me down. I booked a 1-on-1 conversation with Barry Eisler at our Publishers Launch Conference at BEA right after he announced his decision to turn down a 6-figure advance to self-publish. Alas (for this objective of mine), the morning of the event Barry signed a contract with Amazon to do his next book with them. Although he has self-published some short fiction. Eisler’s story became that he is an Amazon-published author, not a self-published author. That’s a good story and we had a good session on-stage that the conference audience benefited from, but it was not a a self-publishing report from an author who truly did it on his or her own. So I was pleased to learn with a phone call that, not only was Mayer an enagaging talker, but that he was willing to make the journey from his home in Seattle to San Francisco to discuss his success with a conference audience. But what became clear when I had a further conversation with Mayer the day before our conference, buttressed by what was said by many other participants at the event, is that the Hocking-Konrath-Locke story — an author managing all the pieces of their publishing program and and achieving a totally private success — is a Dodo bird. Unless we consolidate down to an only-Amazon ebook world, which, despite Amazon’s best efforts, doesn’t seem likely anytime soon but would undoubtedly create a whole new rule book if it ever arrived, the work and expertise required for successful publishing will lead inexorably to one of two results. Either an author will get help to publish their own material — a distributor like Constellation or Ingram or a publisher — or they’ll find what they built to serve themselves would be better and less-expensively maintained with the work of additional authors to go along with their own. There’s enough work and expertise involved in what had first seemed to many such a simple process that it requires building a bit of a machine to do it. And once a machine is built, it is just wasteful to leave it idling between the works generated by any one writer. This point was made by Mayer when he told me that he is now recruiting other authors to publish. He started out by finding a partner to handle the technology component and mechanics of his efforts. In his already-substantial experience in less than a year, he has learned that proper editing is essential, as are eye-catching covers, as is the right metadata. He told me and our audience that a single complaint from a reader to Amazon about a typo in one’s book can result in the ebook being taken down for a required correction. He has learned, as others have, that maximizing revenue requires changing and re-changing your prices, which is more work. Bob says he has even fixed plot errors that were pointed out by Kindle readers. Bob says books can disappear from major retail sites for no apparent reason as well. 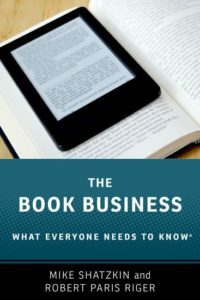 He says that anybody who believes that ebook publishing is like “sending the book to a printer, after which you can forget about working on it” is mistaken. And he believes that any author whose work is good and wants to take a self-publishing route would be wise to cede a percentage of sales to him, or somebody else, who has learned what he has and equipped themselves to prepare books properly for sale and manage them after they’re launched. This is establishing ever so much more clearly that publishers are right when they say there’s a role for them in an ebook world. Amazon itself makes that clear by the difference in the deals it offers self-published authors and authors it signs for its imprints. Although authors will continue to self-publish, the debate that matters in the future is what the basket of services will be that authors require and what will be the right price for them. The lines are drawn for that discussion and the opinions are really all over the lot. There are ebook publishers — the granddaddies eReads and Rosetta, Scott Waxman’s Diversion Books, and the giant in the space: Open Road — who are saying the “right” ebook division between author and publisher is 50-50. (We should make clear that this is the division of the revenue obtained from the retailer or “sales agent”, which would normally be 65-70% of the selling price or 50% of a publishers suggested list which could be discounted, depending on what kind of sales arrangement is in place.) Smashwords, an entirely automated service, and BookMasters, a service provider, provide distribution for 15% of the take. Two agents speaking on our panel in San Francisco, Deidre Knight and Laura Rennert, are capping their agency’s take at 15% of the revenue as well, as they walk the ethical line that is perceived by some to require that they make no more money self-publishing an author than they would selling the rights to a publisher. Then there are many other service offerings with prices that fall in between 15% and 50%. Amazon’s rules offer some insight on this. If you work with them through their KDP service, you get 70% (if you set your price within their accepted bands). But, as Mayer and others at our conference made clear, through KDP you can’t even purchase any special merchandising or promotion. But if you are published by Amazon’s imprints, the take is cut in half and the author gets 35% of retail, but you get lots of promotion by positioning. (Deals are private, and the details of Eisler’s deal have not been revealed, but the presumption would be that he earned out his rumored six-figure advance from Amazon at the 35% rate.) Thirty-five percent matches what a 50-50 publisher could deliver if they had an agency-like deal with the retailer. The comparisons get complicated, but, if a conventional publisher is providing the full range of services that our speakers said is needed to maximize sales: good covers, changing covers, dynamic pricing, constantly improved metadata, monitoring to catch glitch take-downs, as well as developmental editing, line-editing, copy-editing, and proofreading, the author wouldn’t be doing badly at all to get 35% of the consumer’s dollar for an ebook. Throw in real print book distribution and sales and the royalties and marketing from that, plus a publisher’s core marketing effort (being part of a “legitimate” list gets attention from reviewers, bloggers, library collection development, and other places that matter), and, perhaps, some dedicated marketing as well, and it can be a relatively profitable exercise for an author to be with a publisher for even less than that. When agency publishers pay 25% royalties, they are giving the author 17.5% of the paying customer’s dollar. Everybody will draw their own lines, deal by deal, but that doesn’t strike me as totally crazy as long as print sales remain more than half the total and the publisher is paying an advance that carries with it some risk that the actual royalty paid will be higher than what the contract stipulates. That’s a moving target, of course, I personally don’t expect print sales to remain at half the total very much longer. But if major publishers were paying 50% royalty on a 70% agency sale, they’d be matching the 35% Amazon pays the authors it publishes. Amazon can do much more to promote on Amazon (which panelists at eBEE said is what really moves the needle); but publishers make noise in a lot of other places Amazon (yet) doesn’t. Presumably Open Road and Diversion and eReads and other 50-50 ebook publishers can’t match the agency terms with Amazon (they can get 70% through KDP, but that comes with pricing restraints and required agreement to those other deals we discussed earlier), so only the Big Six, who can apply agency across all accounts, can offer a comparable deal with a manageable percentage payout. Amazon is demonstrating what they see as the value of securing the loyalty of digital book consumers for its ecosystem by their willingness to pay full wholesale price for an ebook that will then get lent once, as well as their penchant for pricing for sale well below their cost. The evidence that agency pricing is the only wall between a multi-channel ebook business and a single-retailer monopoly continues to grow. But as long as print in stores matters, and it will for a while longer, the Big Six have a legitimate commercial argument to defend ebook royalties between 25 and 50 percent. After that, everybody except Amazon will be hoping that that the Nook, Kobo, Google, and Sony market share is enough to keep it essential to an author to cover them all. And that means of discovery and merchandising will emerge that are a meaningful alternative to what is provided by the world’s biggest virtual retailer.